“Seashell” necklace is a summer stunner! - Susan Said... WHAT?! Sweetheart neckline, spaghetti strap, strapless… summer dresses just beg for a dramatic necklace! And this summer, I found another stunner from Afterglow Jewelry. This beautiful necklace is inspired by the season’s clear blue skies, inviting ocean, and tiny treasures found on the beach. This stunning “seashell” necklace is created with the highest quality Austrian crystals in a gorgeous blue topaz shade and diamond clear accents. The solitaire itself, as well as the delicate stones which swirl around it, are sparkling Swarovski Elements® that wink, catch light, and reflect it beautifully in the summer sun. The piece is manufactured using sophisticated Austrian polishing and electroplating equipment, and the stones are inlaid under a microscope by the most skilled artisans. This is the perfect pendant to wear alone as a dramatic statement piece. Or, use it as the basis of a layered look of multiple single pendant pieces – a look which is still trending for summer! A few of my favorites to pair with this necklace include Afterglow’s Bombay Pendant and Afterglow’s Solitaire. Like the “Seashell” Pendant, these are high quality, well made jewelry pieces are from a name you can trust. Afterglow Jewelry has been crafting beautiful jewelry since 1972! And, all pieces are environmentally friendly, lead-free and nickel-free. Plus the manufacturing process is always free of animal use or products. The “Seashell” Pendant is available on Amazon Prime for just $13.95. In addition to the blue topaz shade, this style is also available in classic diamond clear and striking royal blue (sapphire). To see the entire line of gorgeous and affordable pieces, visit Afterglow Jewelry. PHOTOS: Used with permission by Afterglow Jewelry. DISCLAIMER: No financial compensation was received in exchange for this post. 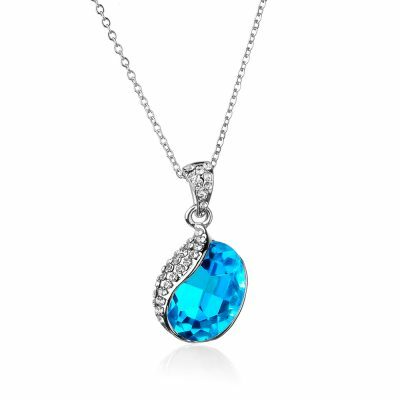 I did, however, receive a promotional sample of the Afterglow Jewelry crystal pendant mentioned above in order to fully evaluate the product. Regardless, I only recommend products or services I believe will be good for my readers. Lemon fashion trend is oh-so-sweet!